Great news Willamette Valley, we all live about 50 miles from one of the greatest stretches of coastline in the world, and thanks to early Oregonians we can all enjoy it. Oregon’s beaches are mostly owned by the state, and since we’re a “lodestar” state as Governor Tom McCall put it, we’ve led the way in how to manage the coastline for all to enjoy, not just the privileged few. Of course, early-on there were private interests who sought to acquire and control sections of the coast, but they were out maneuvered by Oregon Governor Oswald West. Governor West was a strapping cowboy who rode his horse all over Oregon, and took on the timber industry, private interests and all who sought to rob Oregon of its natural resources. In 1913 Governor West declared the entire length of the Oregon Coast a part of the state highway system – since it was used for commerce, of course. Hence, no private development. In the 1960’s when a motel owner in Cannon Beach decided he’d just fence off a section of beach for his clients only, the concept of public access was put to the test again. Governor Tom McCall flew to the beach with two helicopters filled with surveyors, engineers and aides. In dramatic fashion, they landed at the beach and made quite a show of the whole event. In the following weeks, with lots of help from the news media, the public outcry for open beaches could be heard all over the state – particularly in Salem. On July 6th, 1967, bi-partisan legislators passed the Oregon Beach Bill guaranteeing public access to Oregon’s beaches. Also of note, the formula for just how far the public easement extends up the beach was developed by a team of scientists from Oregon State University – go Beavs! To truly appreciate our wealth of public beach access, try going to Malibu and toasting a few marshmallows over an open fire. Or even finding a way to get to the beach. The “Hollywood Elite” doesn’t want you down there and will at least try to have you arrested. In sections where the state of California has forced public access to the beach, the residents have used creative tactics to keep you, the impoverished, out. They have painted the curbs red to illegally create no parking zones, they post “private beach” signs, also not true, and they even put out cones, to fool would be beach goers into driving on. Clearly, they don’t realize that many (most?) of Oregon’s sandy beaches are every bit as nice, and everyone can go there and get along, surf, roast a hot dog, soak up negative ions, whatever. As one of our current legislators would say, it’s so much more “the Oregon Way.” The 60’s surf films that were staged in Southern California, where everyone was having a great time on the beach, that’s illegal now, unless you’re in Oregon. The Beach Boys all wore Pendelton shirts, perhaps that was an unspoken nod to how much they wanted to be on the beach — in Oregon. Lincoln City is kind of a “big city” of the central coast, so you’ll find the Lincoln City Outlets. The outlets include all the usual suspects like Nike, and Columbia Sportswear, and some gems like a kitchen store with some great deals! Also in Lincoln City is The Tie Dye Pie Pizzaria – a funky little place, but if you have a hankerin’ for some great pizza, go there. Want to visit the oldest restaurant on the coast? It’s also in Lincoln City – Snug Harbor Bar and Grill is a landmark, with a full bar and a great upstairs deck and it’s dog friendly if you’re travelling with your furry friend. A tiny town with a strip of the usual touristy shopping options, and probably the best spot on the coast to watch whales, and boats as they navigate the treacherous channel to the world’s smallest harbor. The people who drive their boats in and out of there in foul weather are fearless! When there are big waves, the wall along the bay creates a huge geyser of water that is always exciting. And the main attraction… when whales are around, they like to stop in the harbor and swim around. You can see them clearly from the sidewalk – it’s a special spot. Stop there and just hang out for a while, you’ll like it. The Lookout and Gift Shop sits right on the cliff at the cape, 500 feet above sea level. Cape Foulweather was named by Captain Cook as his expedition sailed past, and experienced high winds and – foul weather. The gift shop was originally a stage stop for coaches travelling between Lincoln City and Newport, then it was purchased by an executive of the Hershey’s Chocolate Company after he spotted it in his travels to the “wild west.” He and his wife moved to Oregon and ran it as a restaurant for a time, but they came to realize that visitors wanted gifts and souvenirs, not food. So, the gift shop was born. Home of Mo’s West, the parking lot at Otter Point offers some great seafood, and Mo’s signature offering, clam chowder. It’s also a great vantage point to watch surfers, or drop a quarter into the telescope for a look at sea lions and the “Devil’s Punchbowl.” If you want to do a little surfing, there’s a staircase down to the beach and it’s a great spot. Check out the surf shop that is right across from the staircase. Beverly Beach, approved by Small Hans! Maybe the best State Park in Oregon. You can walk from your campsite, under the highway to the beach. Reserve early! A historic section of Newport that is at the water’s edge above Newport Beach. Lots of tasteful shopping, and great restaurants. A must-see for the coast visitor! The historic bayfront. Lots of touristy stuff here – Ripley’s Believe it or Not Museum, Shopping, Mo’s Clam Chowder, and one of the best restaurants in Oregon, Local Ocean offers ocean-fresh seafood expertly prepared. While you’re there you can check out the Newport fishing fleet docked right outside the door. If you want something a little less extravagant, but still great, look for the Newport Café back up on Hwy 101. They have great deep-fried seafood, and a colossal burger. The burger might seem kind of like a touristy gimmick, because it is, but… it’s also one of the best burgers you’ve ever had – bring friends – like four of them. Newport Cafe, take 4 friends and get one hamburger! You’ll come to Yachats, one of the gems of the coast. A tiny town that is big on style. Look for the pastel-colored motels at the north end of town and more fabulous beaches. At the mouth of the Yachats River there is a great beach to walk and contemplate, and in the little town there are great restaurants. Check out the historic Little Log Church. Completed in 1930 from logs floated down the Yachats river, the church served the local congregation until they outgrew it and built a new church down the street. The building was sold to the Oregon Historical Society on the condition it be maintained as a museum. Lots of interesting history to be found there. 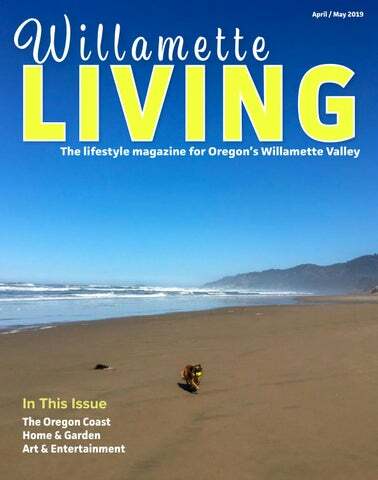 Of course, all of the central coast towns have various events throughout the year, search online and of course, keep an eye on WillametteLiving.com!